To the surprise of many, fruit has appeared on peach trees in the replanted Peach Orchard at Gettysburg National Military Park. This view was taken facing west at approximately 4:50 PM on Monday, August 16, 2010. 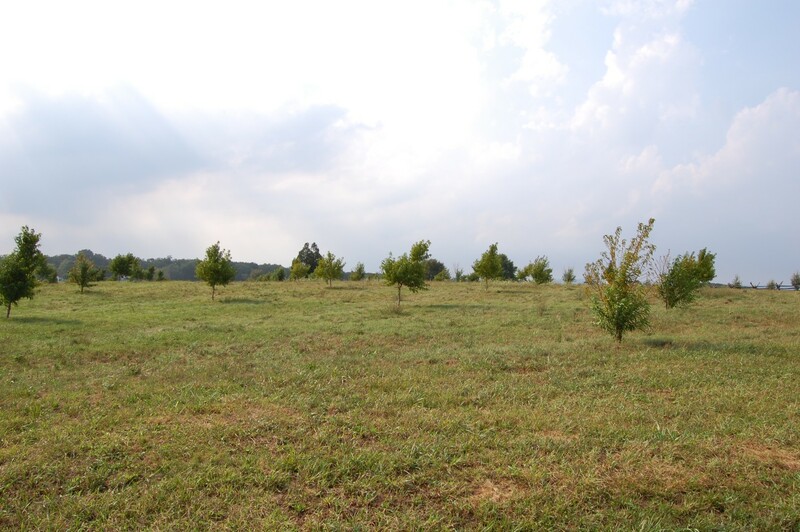 We have covered the replanting of the famous Sherfy Peach Orchard since its beginnings in April of 2008, but this latest stand of trees is hardly the first attempt. 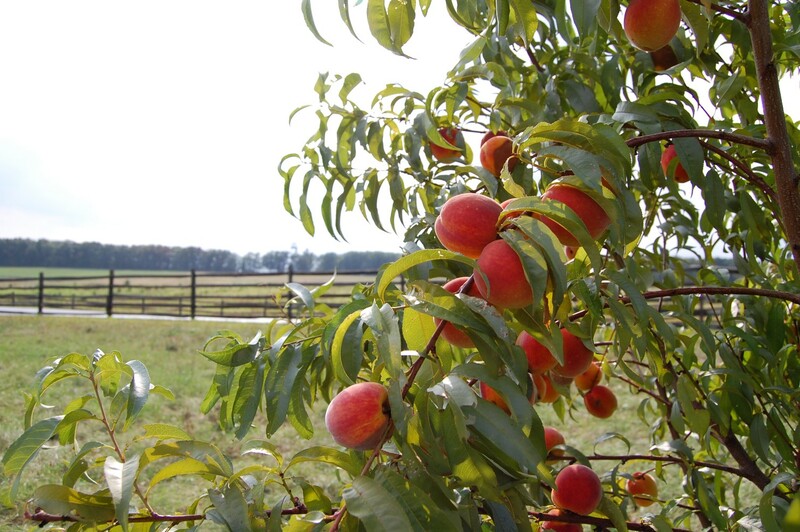 The last planting in the Peach Orchard went afoul due to the Tomato Ringspot virus, which had caused removal of a large number of trees in the orchard as early as 2006. 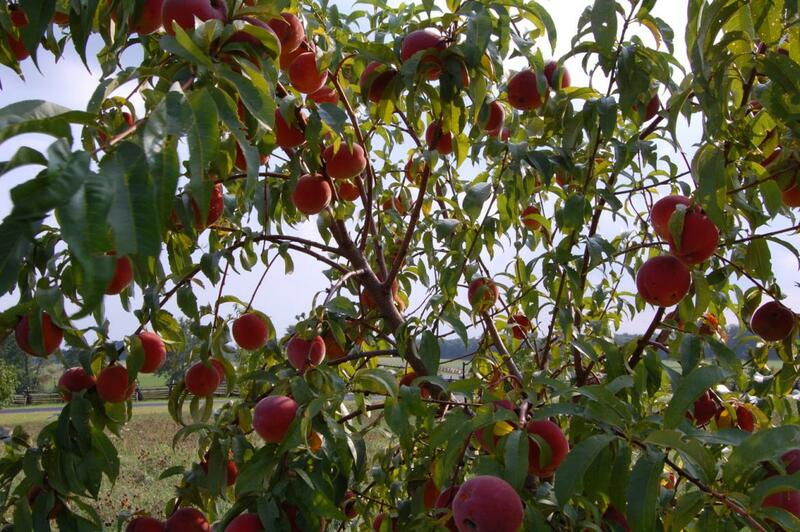 Another virus, the plum pox virus (discovered outside of Europe in south central Pennsylvania in 1999), is also a concern for the orchard. 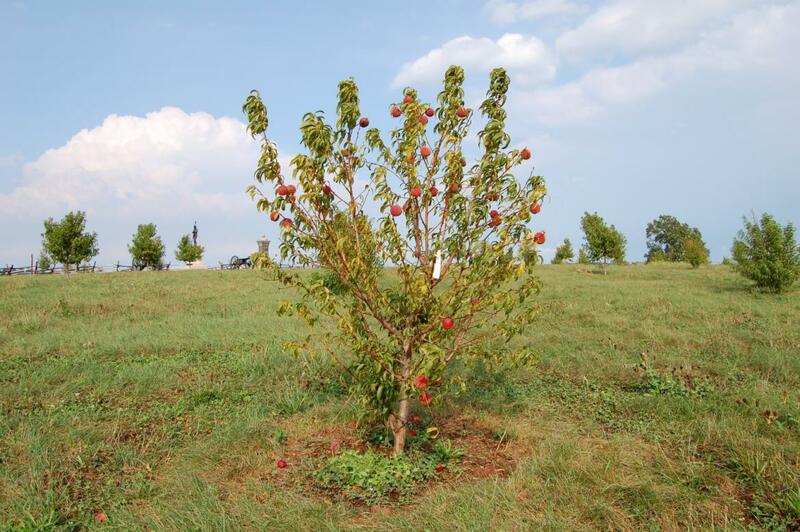 Though researchers and farmers have gotten control of the disease in the last decade (it was declared eradicated in October of last year), it was decided to make the trees in the Sherfy Peach Orchard devoid of fruit, growing them in a purely ornamental capacity. And from the outset, it’s a bit hard to tell anything is amiss. 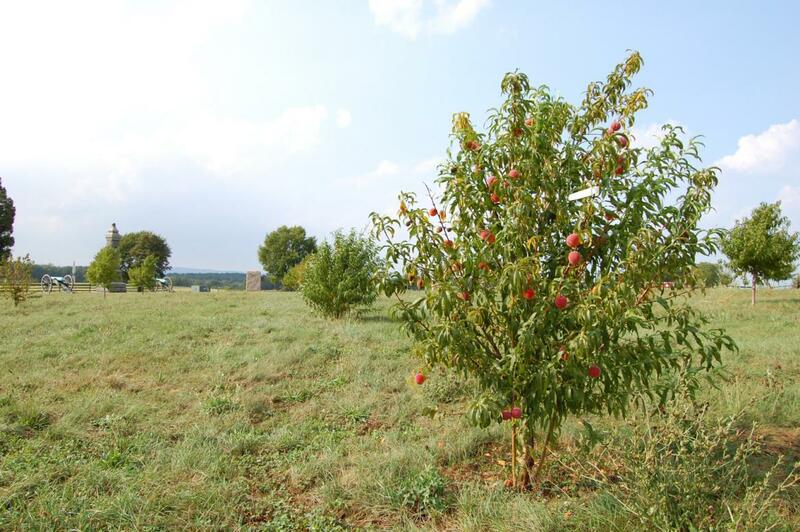 Standing here at the northeast corner and wayside to the Peach Orchard, it’s difficult to see any trees bearing fruit. This view was taken facing northwest at approximately 4:50 PM on Monday, August 16, 2010. 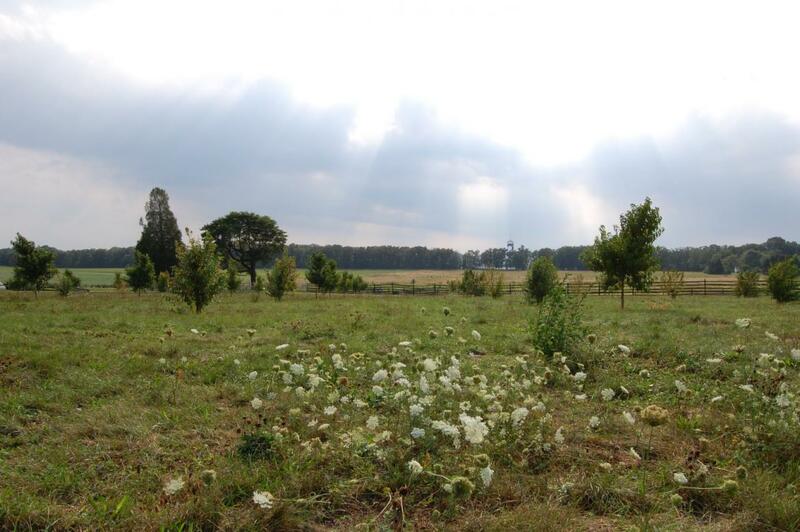 So we’ll take a bit of a walk into the orchard proper … The Longstreet Tower is in the center background. This view was taken facing west at approximately 4:50 PM on Monday, August 16, 2010. This tree in the center here is covered with fruit, while many around it are not. But it wasn’t the only one … This view was taken facing west at approximately 4:50 PM on Monday, August 16, 2010. There was this one … This view was taken facing northeast at approximately 4:50 PM on Monday, August 16, 2010. And this one. In all, we counted about a dozen trees that had produced visible fruit. Many of them have been tagged with the white tag visible in this shot. This view was taken facing north at approximately 4:50 PM on Monday, August 16, 2010. 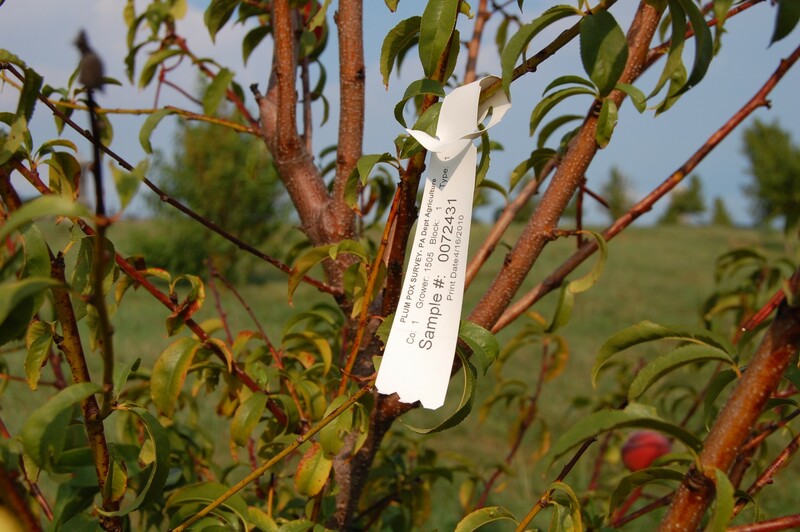 The tag is a plum pox survey tag, noting the sample number that was taken from this tree for testing. We have heard in the last week that the fruit may be picked entirely from these trees if it’s determined that they are a risk to the rest of the orchard. This view was taken facing north at approximately 4:50 PM on Monday, August 16, 2010. 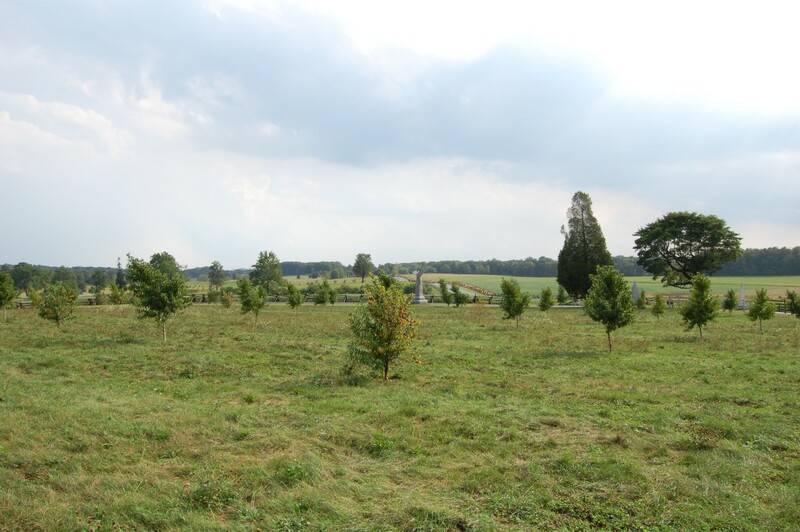 Most of the fruit bearing trees were concentrated on the west side of the rise in the orchard. This rise is visible here, from the east side. 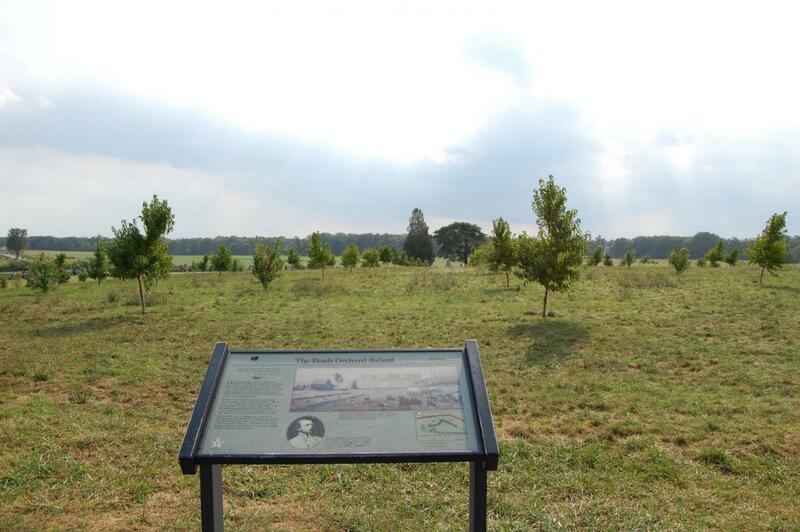 Many say this obscured view of Seminary Ridge from behind/east of the orchard worried Major-General Daniel Sickles enough that he chose this ground to position his line (in its famous salient) on July 2, 1863. This view was taken facing northwest at approximately 4:50 PM on Monday, August 16, 2010. This view was taken facing southwest at approximately 4:50 PM on Monday, August 16, 2010. The Longstreet Tower is in the background of this shot. This view was taken facing southwest at approximately 4:50 PM on Monday, August 16, 2010. 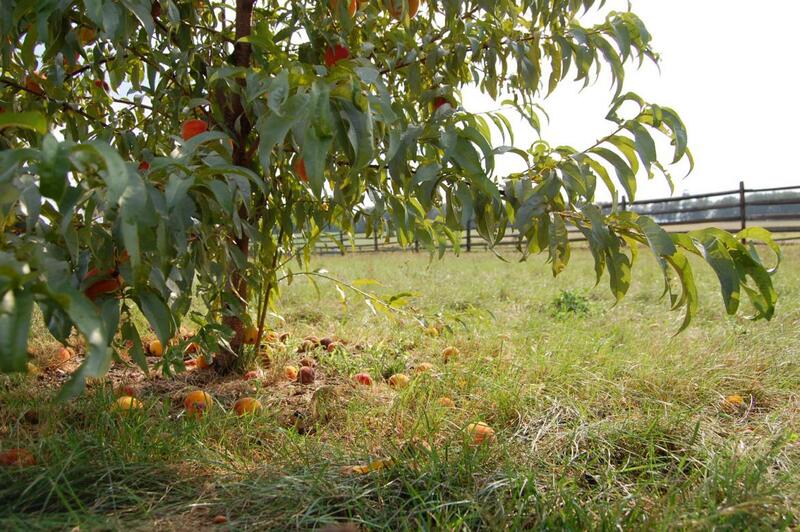 Sherfy’s Peach Orchard Progess: Two Years After Planting on April 23, 2010.